he Transportation Improvement Board created its performance management dashboard in 2003. Today the dashboard - in its fourth iteration - helps the agency to monitor financials and measure program effectiveness. A dashboard is a software application that tracks business activity; similar to the way an automobile dashboard displays essential information to drivers. The Dashboard pulls data from several different sources into one view, so performance trends can be recognized more quickly. The dashboard provides the public the same exact view the Executive Director has to manage the agency's $200 million of revenues generated from 3 cents of the state gas tax. The Washington State Transportation Improvement Board (TIB) is an independent state agency that makes and manages street construction and maintenance grants to 320 cities and urban counties throughout Washington State. TIB uses a performance management dashboard to track its business processes and projects and to establish an accurate overview of the agency's performance. Prior to 2001, the agency had awarded many more projects than it could afford. The costly construction bill was coming due just as a new management team took over. 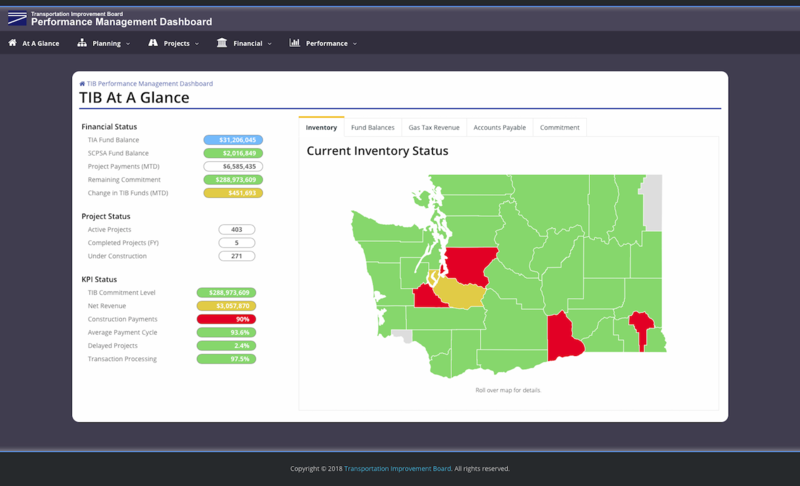 TIB created the Dashboard in 2003 to help the agency work through the excess allocation and stabilize its programs. The Dashboard was released on the public facing website in 2007. Decreased the number of delayed projects by 70%, saving millions in public funds due to construction inflation costs. Projects receiving funds for safety reasons averaged 19% fewer accidents and 30% less injuries two years after construction. Small city pavement condition rating scores above 70 increased 35% between 2007 and 2012.
and project selections, view the TIB Performance Dashboard. The Government Finance Officers Association (GFOA) recognized the Washington State Transportation Improvement Board at its national convention in Ft. Lauderdale on June 17, 2008. The Award for Excellence in Government Finance is the most prestigious recognition of the GFOA. The Award for Excellence in the category of Management and Service Delivery is the first award TIB received in its 40 year history. GFOA cited performance management as a principal factor in making the award. The Council of State Governments (CSG) selected the agency for a 2008 innovations award in recognition of TIB's real-time performance management (RPM) dashboard on July 21, 2008. The Washington State Quality Award is awarded to organizations that have implemented and achieved exceptional quality performance. These organizations are seen as models for organizations throughout Washington and the nation who seek the same results.